...And She Was Insured, Too! "Find Someone To Sit With You"
Children used to have and use 'copybooks' to practice their penmanship. Oh yes, this was in the 'old days' my friends. 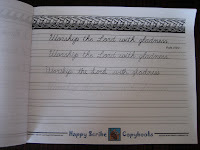 Although I am apprised that some homeschoolers are now using "copybooks" in their curriculums and bringing back the concept. Copybook headings would often be a Proverb from Scripture or maxims, such as the one below. I had been prompted as I watched a Frances & Friends show on the SonLife Broadcasting Network (Ch. 344 on DirecTV in Portland Oregon :o) to check out a fellow by the name of Curtis Bowers who had apparently made a film entitled "Agenda: The Grinding Down of America." I found a copy of the DVD at the Clackamas County Library (Multnomah Count Library didn't have it, but I have a library card for both libraries.) and have not viewed it yet, but will be shortly. However, I did find a YouTube video of Mr. Bowers giving a presentation apparently to a group of folks in a church....in which he describes what brought him to the point in his life where he felt he had to make this film. It was a case for him - well, you remember the adage that all it takes for evil to triumph is for good men to do nothing? He did not want to be "one of those guys" who did nothing. Now,,,,at the end of Mr. Bowers talk, who, by the way, by every word he spoke, is a sold-out Christian, born again by the Precious Blood of our Lord and Savior, Jesus Christ,,,,and also by the way is a legislator from the state of Idaho,,,,any way,,,,at the end of his talk, Mr. Bowers read the following poem, writtten by Rudyard Kipling. The day I bought my Lincoln Town Car Cartier was a very special day for me. It was used, but then, in so many ways, so am I. But it is beautiful...yes, to this day, still. Today someone driving thru in my local gas station actually sideswiped my right exterior rear-view mirror while I was parked at the pump, altho upon inspection, no damage was observed; we shook hands, and departed from one another. But this is about another story where my lovely, Diamond White Lincoln Town Car Cartier, was hit while I was parked, and a whole lot more than the right rear-view mirror was sideswiped. neighborhood; much of it on Mississippi Ave., which has become a haven for all the yuppies around. Lots of little eateries and places to get those microbrews Portland, Oregon is so famous for. Two friends and myself decided to have dinner in a nearby Thai cafe. We drove up to Mississippi Ave in the Town Car, parked on a corner across from the cafe and went inside to eat. On our way in to the cafe we could hear voices, laughter and music coming from a nearby beer garden further down the block. Yes, an excellent night for outdoor festivities. There would be outdoor fun going on all up and down Mississippi Avenue this night. Like I said, perfect weather. We all went in the Town Car, parked on a corner across from the cafe and went inside to eat. We chose a table very near a secondary door which opens out onto the street away from the main entrance to the restaurant. Shortly after we had been served our dinner selections, this very side door nearest the street burst open and a woman came in, asking in rather a loud voice, "Does anyone in here own a white Lincoln?" Uhhhhh......I intoned, barely able to catch my breath, "I do." The woman came to our table and said, "I just hit your car." Now I absolutely cannot catch my breath. This dear woman said quickly that she had insurance and wrote down her name and her insurance company, her driver's license number, and what other pertinent facts we needed to share, and together we left the restaurant to see what had transpired. The entire right side of my Lincoln Town Car, from the rear fender to the front fender, side rear-view mirror laying in the street, was crumpled, battered, bruised, torn-up! The woman had an older Cadillac and had attempted to park at the rear of the next corner (I was parked in the last spot at the front of the block on the corner across from the restaurant.). Mind you, these two blocks and their combined corners were slightly offset, the one she was aiming for a little further in than the one where I was parked. Apparently, as she began to pull her long Caddy into her spot,,,,,she just misjudged and it being twilight to dark now, she just --- well ---- she made a mess of things. At first she was fearful, saying she would just pay for the damages...but little did she realize that she had done nearly $5,500 in damage to my car (that was the final bill). Fortunately, her insurance company had the matter well in hand, and in the end, everything was paid for. I have a great recommendation for body work by the way. Bob Thomas CarStar! Those guys are AWESOME! To add flavor to this story, listen to this. This dear lady told us, my friends and I, that she had no idea where to find the owner of the car after she hit it. She said she had no idea what to do...hearing all the festivities going on in the area, like I said, there were parties everywhere at all the outdoor brew fests in the vicinity...and even admitted she didn't even really want to try that hard to find the owner...since she just felt it was going to be a hopeless impossibility - BUT - she said she had ordered take-out from the very restaurant we were dining in - and something just told her to blurt it out when she came in to the place, "Does anybody in here own a white Lincoln?" This is a pretty good sized restaurant, by the way, kind of L-shaped....and Who arranged it so that WE would be sitting right at the table nearest that side entrance door,,,,,the one I never use, by the way....I always came in the front entrance, which is all the way on the other side of the building...but for SOME reason,,,,we were seated exactly adjacent to that side entrance door! Are you knowing Who my protector and provider is yet? Amen if you said the Lord, Jesus Christ, and His Father, my God! And to finish this little tale off with the perfect ribbon bow -- my Lincoln had been T-boned about a year previous. The repairs were to the hood, driver's side fender, and driver's side door. The paint job, though particularly admirable and even explained to me how it was a 3-coat job plus clear coat (hey this is a fancy car, what can I say...Cartier is the top of the line in Lincoln Town Cars - there aren't that many of them even out there I discovered...but the Lord gave me one. )...and even though that was some find paint job -- if you looked at the side in just the right light at just the right angle - yeah, you could tell the difference between the driver's side door and front fender, and the left rear door and left rear fender. I guess He just wasn't satisfied with that, and orchestrated another little bit of business so that the entire left side would be repaird and painted so that all the left side would match. That's just my theory. But don't we know that our God really is a God of details? I was watching The Forsyte Saga, a BBC mini-series starring Damian Lewis (Emmy winner for best actor - "Homeland"). There was a funeral depicted for the elderly uncle and I heard part of this poem, "Fear no more the lightning flash" ---- and it just struck me and I wanted to hear the whole poem. I found it easily enough so here it is. a series about a police investigator named Wallander, starring Kenneth Branagh, one of my favorite actors. I just watched "Conspiracy" several days ago - the story of a meeting of high-ranking Nazi German officials who planned the "Final Solution," that is, the extermination of the Jews from Europe en total, and Germany in particular. His character, Reinhard Heydrich, was a spot-on portrayal of a true sociopath. Branagh's character, a troubled man, policeman with a conscience and compassion, struggling to always "do the right thing" not only for himself but for others, has an aging father in the story. His father, a brilliant man in his own right, is suffering from dementia, and as he flip-flops between reality and his brain-deprived view of what is really happening to him and around him, has these moments of true lucidity that just make you grab an extra helping of air in order to capture the moment. Povel, Kurt Wallander's father in the series, played by David Warner, an actor with over 200 movie titles to his own credits, is quite ill and has just asked his son to take him home. He doesn't wish to die in a bed alone in some hospital ward. When they arrive at Povel's home, a lovely spot by the sea, Kurt gets out of the car and says he'll open the studio. Povel has always been a painter, landscapes were his passion, and they are beautiful paintings. He spent most of his time in the studio. But Povel says "No, ahhhh, finished. Just wanna sit." He turns to Kurt and says, "You don't look do you? You don't look at the world. You just drive straight through it. Stop. And look." He adds, "Go on, off you go. I'll be all right." Povel heads toward the sea shore to a familiar spot, a lovely wooden bench overlooking the sea. His wife says to Kurt, "I'll sit with him." Povel turns once again and speaks to Kurt. "Find someone to sit with you. You're not strong enough to do it on your own. Nobody is. Find someone to sit with you."